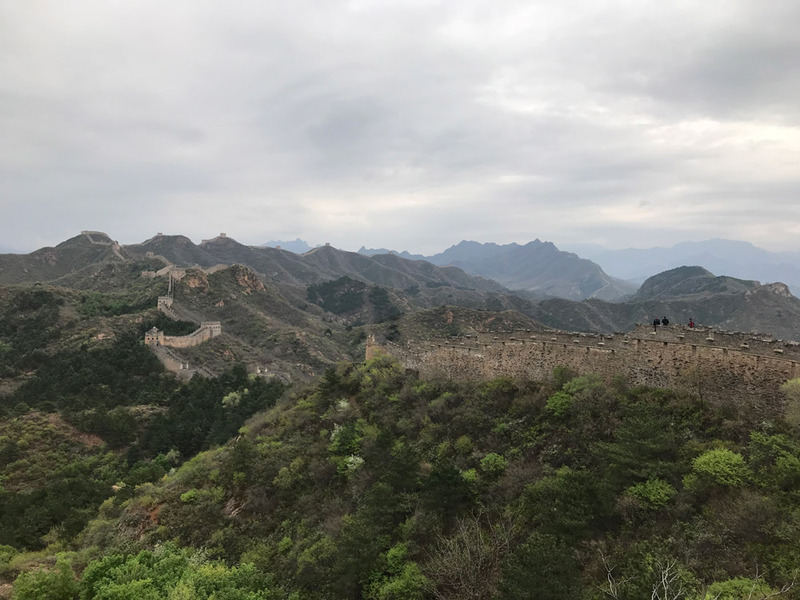 In April this year, myself and three other (p)lucky adventurers from Signal set out on the challenge of a lifetime - trekking along the Great Wall of China, where it meanders through many miles of remote villages circling Beijing. Signal China trekkers, L-R: Karen Wyatt, Lakshmi Balakrishnan, Graham Duffield and Leah Munting. We prepared ourselves for what was billed as a mental and physical battle between man and the man-made. 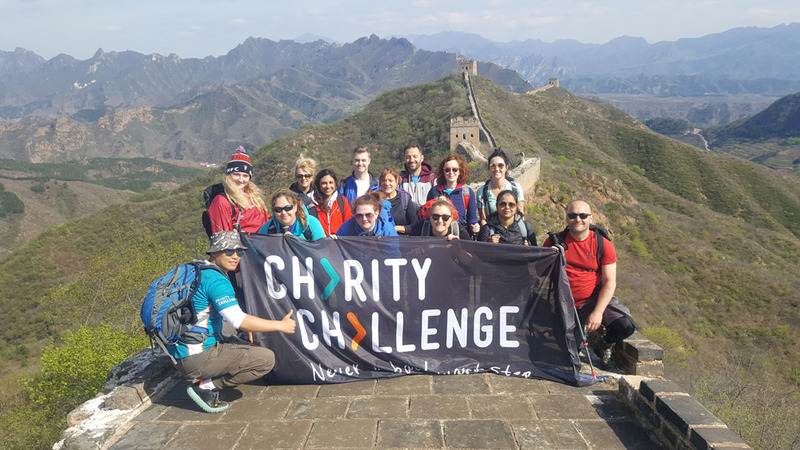 We were to conquer the impenetrable Wall, with its incessant steps, staggering climbs, demanding descents and searing heat - all to raise money for one fantastic charity - The British Heart Foundation. 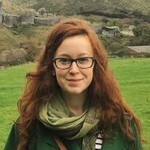 Meeting our fundraising target of over £6,100 was no mean feat. We’d been frantically raising money since the previous August. As mentioned in the article I wrote during this time, we did everything we could to encourage donations, including organising raffles, gin tasting evenings, auctions, street collections and bake sales. So as we departed Heathrow, we felt lighter knowing we’d smashed our target, raising over £7,900 for BHF. Signal also covered the cost of entry, bringing the final total to £14,177. Over 10 hours in the sky and 8,000km later, we finally landed and got some rest, having leapt seven hours in the future. We woke up for the first day of our trek jet-lagged and nervous. The iron sky outside belied the forecasts of sun, but our backpacks were bulging with wet layers, dry layers and any other layer we thought we could possibly need. So with our belongings stowed safely, we journeyed by bus to our first stop at Jinshanling. This is the question everyone asked us afterwards. But it hasn’t been easy to answer. 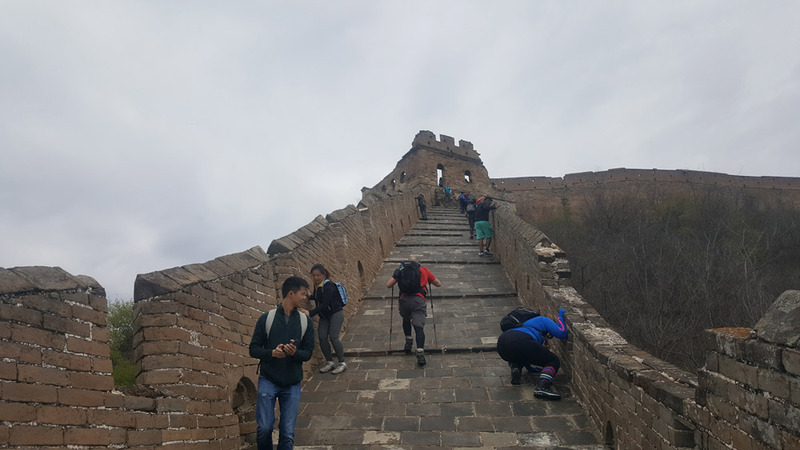 There are few words that can capture the sheer scale and awe of peering up and seeing the Wall rising in front of you. Thoughts flitted through my own mind about the impossible number of bricks, the feasibility of the challenge itself and just how infinitesimal I felt. Clambering up those first steps and emerging through the first watchtower, all descriptive abilities melted away as I looked down and traced the structure with my eyes, seeing it snake away from my feet, hugging the mountain spine and flowing into the endless horizon. Then the terrain bought us back with a bump. We were of course prepared for there being a lot of steps. Extensive scouring of the internet had told us that much. We were sort of okay with the hills too. However, we were not prepared for steps that were sometimes higher than our knees! These would often appear entirely at random, hidden on a downhill or camouflaged in an uphill flight – essentially whenever we were just able to get a pace going. Our guide told us later on that this was a deliberate tactic to slow down invading armies from the North (along with us 21st century trekkers). 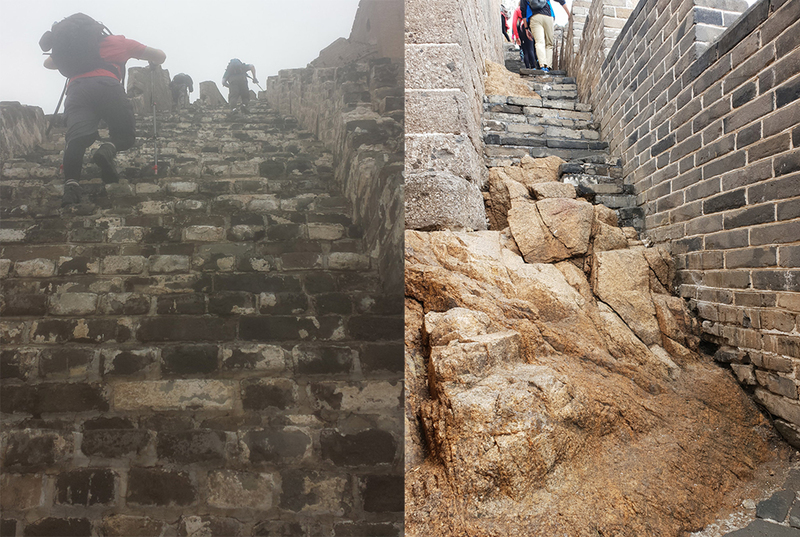 Sometimes there were no steps but this didn’t bring much relief, as we were faced with smooth stone surfaces worn down into a slipperiness by thousands of footsteps over the ages. This brought the high possibility of a long and painful roll to the bottom of the slope, so we were often clinging to the sides of the wall, fingernails digging into the brickwork to stop us from falling. We experienced isolated and unrenovated sections of the wall, which had us picking our way through ancient rubble and fresh undergrowth. This pushed us perilously close to several scary precipices. And then there were the climbs! These were unpleasantly frequent. The terrain never failed to tease us, so when we thought we could see the top within reasonable distance, the Wall would inevitably climb upwards to the next mountain crest and then disappear from view. 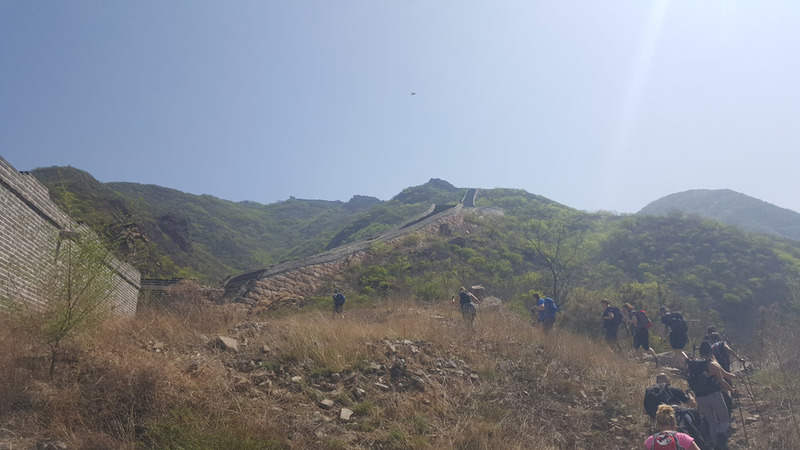 Whilst it’s a popular misconception that the Great Wall can be seen from space, at times the ascents were so steep and unforgiving that we were sure it actually must be true. But for every moment of chest-heaving, sweat-drenching and heart-bursting uphill exertion, there were so many emotional highs. There was the zen-like tranquillity of stepping out from our inn in Gubeikou onto a riverside lined with cherry blossoms, whilst kingfishers darted out, scattering the resident goldfish. 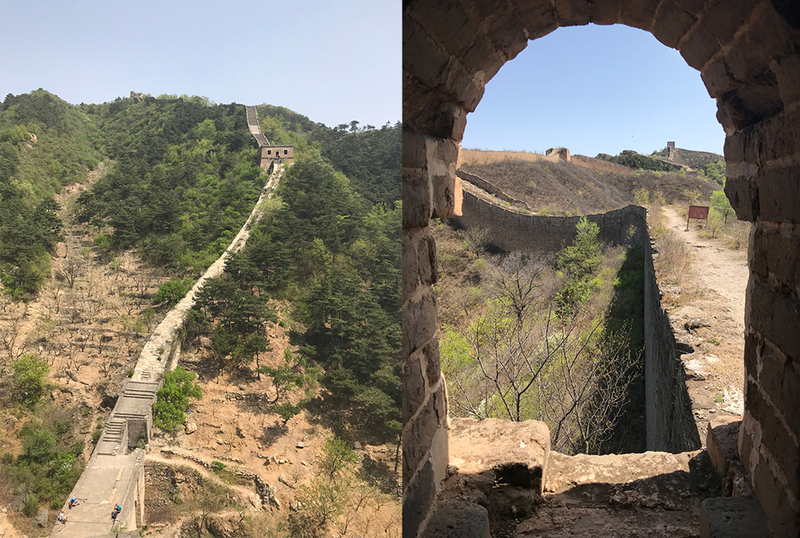 Or when we trekked for over an hour through the dense forest at Mutianyu to get to a particularly remote but original and spectacular section of the Wall, only to find the ladder to climb onto it had gone. Together, our team built a cairn of rocks and scrambled, pushed and pulled everyone up to the most breathtaking and overwhelming view. 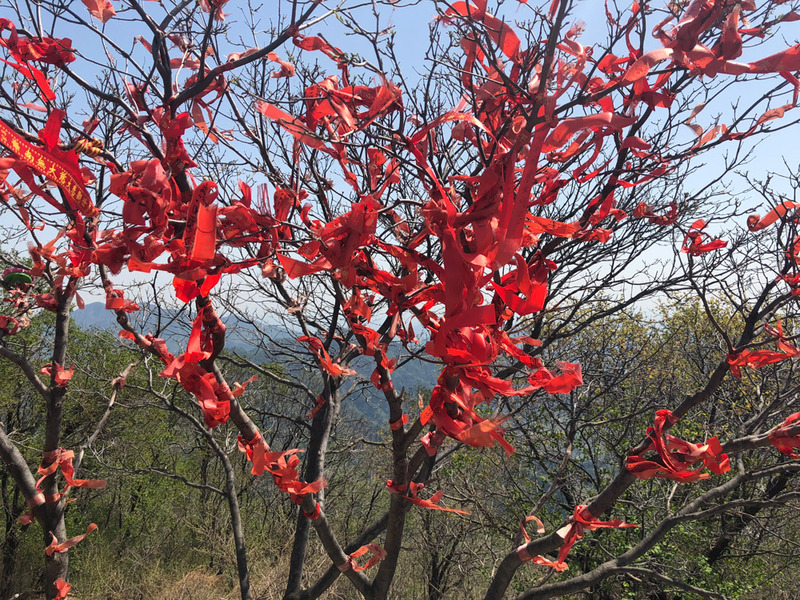 We dedicated prayer ribbons to family and friends and tied them to the trees to whip in the eternal winds at the top of the Heavenly Stairs. 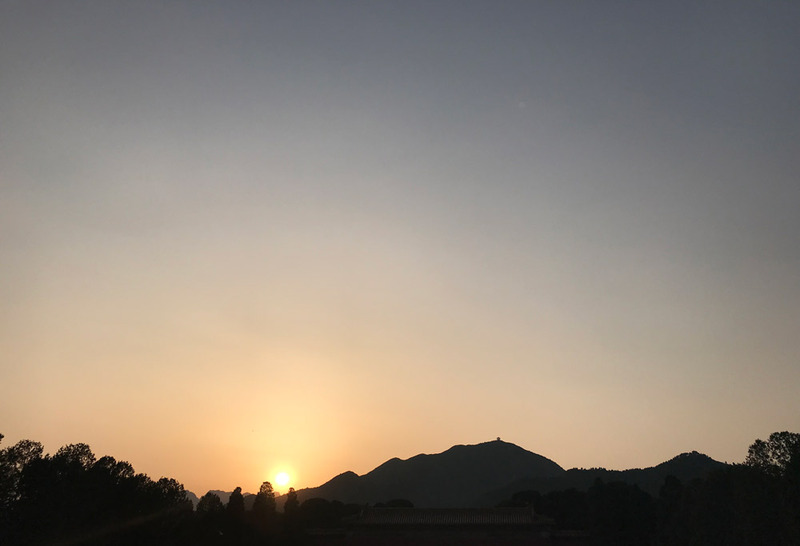 And after a long day of walking, as the last visitors of the day to the Ming Tombs, we were able to watch the sunset fall down behind the temples. We walked for between six to eight hours most days, often not seeing anyone beyond our group. We would mostly hear our own voices, our footsteps, the clack-clack of walking poles, deep breaths and quite often the internal pounding of our hearts. When we woke up on the final day and headed to Huanghuacheng, we were all a little quieter and more contemplative. Scaling the last peak and taking the last step we celebrated the achievement in the individual ways we’d become accustomed to over the past days with each other; Karen’s singing of ‘On Top of the World’ echoing around, Graham beaming from ear to ear, Lakshmi giving it her all right to the end and me simply contemplating the moment. Before that finishing descent, standing on top of that ultimate peak and feeling on top of the world, we laughed (and maybe we cried). We thought about what we’d done, we thought about our loved ones and we thought about home. We thought about walking and we thought about not walking. 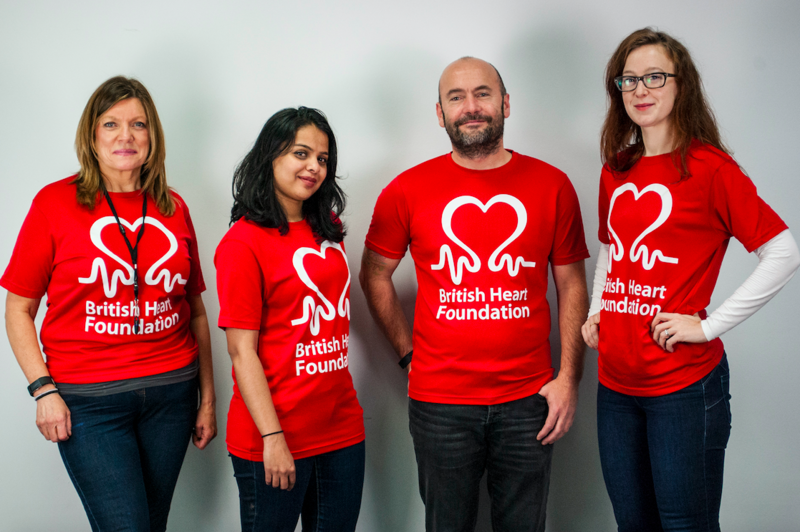 We thought about the journey and just how good it was, how far we had come and what we had achieved, for us and for the BHF. It left us all speechless.